Description: A small sea anemone, up to 15mm across base, adapted to living on rod-shaped substrates around which it wraps its base. Column not divided into regions, without tubercles. Tentacles moderate in length, about 50 in number. General colour cream, buff, pink, orange, or red, usually variegated or mottled: disc often with a poorly defined pattern and usually streaked with opaque white. Reproduces by basal laceration. 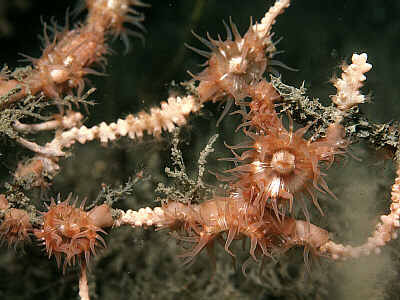 Habitat: Lives on rod-shaped organic substrates, particularly sea-fans, also hydroid stems; in British waters usually on Eunicella verrucosa. Exclusively sublittoral, usually below 15m depth. Distribution: English Channel, southwest Ireland, around western Europe and in the Mediterranean. Formerly common on Eunicella in the Plymouth area this species appears to have become rare in recent years. White individuals have been found on stems of hydroids such as Nemertesia and on the sea fan Swiftia pallida in western Scotland. Further information on distribution and recent occurrence is very desirable. Picton, B.E. & Morrow, C.C. (2016). Amphianthus dohrnii (von Koch, 1878). [In] Encyclopedia of Marine Life of Britain and Ireland.